Protein is one of the three macronutrients required to be eaten in relatively large amounts each day (the other two are carbohydrates and fats). Protein is basically a whole lot of amino acids joined together in a chain formation. Amino acids are what protein is broken down into, in the digestive system of the body. Amino acids are the building blocks of the body - most parts of the body require protein in order to function properly, and not just the muscles. Protein serves as a source of energy for the body and to make up various structural components of the body (such as muscle, bones, fingernails, hair and skin). Protein also has important functional roles in the body - the body uses the protein from foods to create the multitude of protein required in the body. Some of the actions of protein in the body are: to activate enzymes, move skeletal muscles, transportation of various important substance through cell membranes, activate communication of various hormones, provide blood clotting, as well as the regulation of fluid balance and pH. Protein makes up at least 50% of the human body (that is not made up of water). Fruits, vegetables and grains do not contain a great deal of protein in comparison to the foods above. Animal sources of protein usually have higher levels of some essential amino acids than plant sources of amino acids - except for soy (a type of legume), which contains all the essential amino acids. Other legumes (such as dried beans, lentils, peas) and peanuts also have balanced levels of the essential amino acids and are considered a good source of protein, especially for vegetarians. 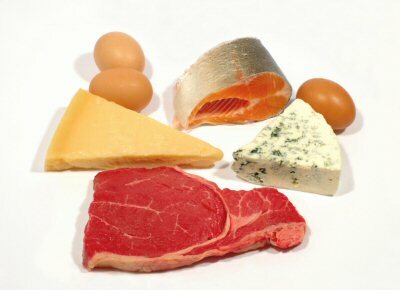 Meat eaters generally eat high quality protein foods, while vegetarians (and especially vegans) need to combine specific foods together in order to get a meal that has high quality protein - while not impossible, it does take extra work and some vegetarians may not be aware of protein quality being a factor in their dietary requirements intake. The Committee on Dietary Intakes (USA) has developed a way to measure the protein quality in a food. This is determine by measuring the amounts of each amino acid in the food and comparing it against each of the amino acid requirements of pre-school age children. A food high in protein is considered to be a complete protein if it contains all the essential amino acids in high amounts. Foods high in protein, but which do not have adequate amounts of the essential amino acids are considered incomplete protein. Most meat / fish / eggs and other meat by-products are complete proteins, so most people will get adequate protein and essential amino acids they require, just from eating regular foods. Vegetarians, on the other hand, have a little more work to do in order to get all the protein and essential amino acids they require, as most legumes, beans, nuts, peas are incomplete proteins. In order to make a complete protein, foods that are incomplete proteins need to be combined and eaten together. This is the way that vegetarians, especially strict vegetarians (vegans), normally get their daily protein requirements. Protein is important because it is broken down into the various amino acids, which are required by the body to produce various essential proteins necessary for the body to function properly. Some of the vital proteins required in the body are: neurotransmitters, blood clotting factors and enzymes. Without protein in the diet, of which the body can absorb the amino acids, and synthesise various proteins, the body would simply not function properly and ill health would ensue. Vegetarians need to ensure they get enough high quality protein in their diet from the food they consume. Soy is the only plant food that is a high quality protein and it may sometimes be difficult (but not impossible) for some strict vegetarians (vegans) to get adequate protein from their dietary intake. Lacto-ovo and lacto vegetarians (who consume either eggs and dairy or just dairy) have less difficulty in obtaining high quality protein because both milk and eggs in particular are very good high quality protein foods. Vegetarians (or those who want to adopt a vegetarian diet) would do well to seek the assistance of a dietician to ensure they are consuming adequate amounts of all nutrients and specifically of high quality protein (to ensure they are consuming enough essential amino acids).